Inger Waage (1923-1995) was born in Stavanger on the West coast of Norway. In 1943 she was accepted as a student at the Norwegian National Academy of Craft and Art Industry in Oslo to study ceramics for three years. After graduation in 1946, she moved back to Stavanger and started her own ceramic workshop. Inger Waage became the first leader of a new established department for handicraft products at Stavangerflint AS in 1953. By 1955 her works were recognised by the market to such a degree that the company had to expand the production capacity by establishing an I.W department, with up to ten assistant artists to cope with the orders of hand painted ceramic objects from the UK, US and other countries. 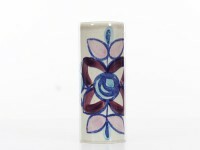 Inger Waage is best known for her hand-painted decorative objects of art from the 1950s. Inger Waage's decorative design for tableware became an important part of her work and of the collection of Stavangerflint. From among her most renowned designs are: Flamingo – Bambus, Flamingo –Chef, Sera, Smørbukk, Senja and Kon Tiki. Bambus is represented at The National Museum of Art, Architecture and Design in Oslo. Her work is also permanently exhibited at the Norwegian Museum of Cultural History in Bygdøy, Oslo. Souvenirs designed by Inger Waage are nearly always signed and are easily recognised by her drawing style. Nearly every town and places of interest in Norway and Denmark has its I.W. signed souvenir, and some towns and places in US are also represented.